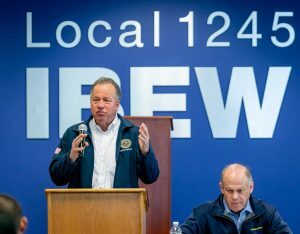 State Senator Bill Dodd is one of IBEW 1245’s greatest allies in the California State Legislature. Among Local 1245 members, he is best known as the author of SB 901, the wildfire bill that the union worked aggressively to get signed into law in 2018. Sen. Dodd took time out of his busy schedule to stop by Local 1245’s January Advisory Council meeting in order to pay homage to the union leaders and activists who flooded the halls of the State Capitol, testifying during committee hearings and lobbying legislators at the 11th hour to ensure passage of the hotly contested bill. He also noted the key role that the union’s business manager played in crafting and passing the bill. Dodd made it abundantly clear that he truly values the working men and women who do the difficult and sometimes dangerous work that most other lawmakers take for granted – and he will never cease to fight for the workers, no matter what the future holds for PG&E. After answering a few questions from members, Sen. Dodd thanked the union once again, and asked if he could go on a ride-along with an IBEW 1245 crew in the near future so he could get an up-close-and-personal look at the work our members do each and every day. The union’s leadership is already working to set that up. As a token of appreciation, Business Manager Tom Dalzell presented Sen. Dodd with a framed photo of an IBEW 1245 crew working in Dodd’s Napa jurisdiction. 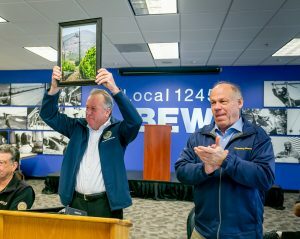 And to demonstrate that the appreciation goes both ways, Local 1245 Business Manager Tom Dalzell gave Dodd a framed photo of an IBEW 1245 line crew working in Napa — where Dodd is from and represents in the State Senate – for him to hang in his Senate office.